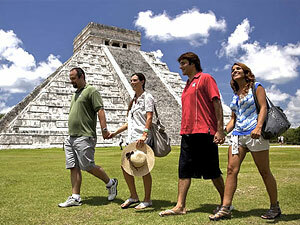 Explore the most important archaeological zone of Yucatan on a full day guided tour from Cancun. Admire the Kukulcan Pyramid, the Temple of a Thousand Columns, the Majestic observatory, the sacred cenote, the ball court among other amazing buildings and sites. This tour departs only from Cancun. 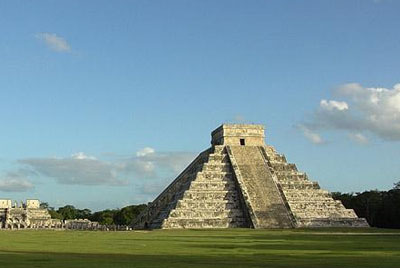 Travel to Chichen Itza on board of an air-conditioned bus from Cancun equipped with washroom. As you arrive to the archaeological site, the guide will take you through the most important buildings and explain to you the details and history of the place. The visit of Chichen Itza includes a guided tour of 2.5 hours with time to take pictures. At the end of the tour we go to the restaurant for buffet lunch, followed by the visit of a cenote where guests have the possibility to go for a swim. Includes lunch, billigual guide and entrances. - 11:00 AM Arrival at Chichen Itza. The total length of the stay on the archeological site is of 3 hours, consisting of one hour and a half of guided tour and one hour and a half of free time to take photos. - 2:00 PM. Arrival at the restaurant PUEBLO MAYA to enjoy a typical Mexican buffet lunch (salad bar, fruit, lime soup, rice, beans, roasted suckling pig, chicken pibil, dessert) Lunch time is approximately 1 hour.